Our First Month at Woods Ferry River Camp has been kind of slow but nice. It is pretty hear and so far not a lot of people have been stopping by. Mostly, this is due to the Suwannee River water levels as they peaked just above flood stage when we first arrived and the fact that kids are still in school. We anticipate to have more visitors once school lets out and people start taking their vacations. We have cleaned, bleached, mowed, swept and shoveled sand, cobwebs, mold and other things off the very boardwalk, the bathrooms, the cabins and around the camping area. The hardest part about the river camps is getting the chlorine water filtration system to work properly. The flooding along the Suwannee River is a real nuisance and messy too. Although we were campground hosts at Adams Tract River Camp last year this river camp is different in a couple of ways. We still have a very nice campsite with water, electric and sewer on-site. We also have a picnic table and fire pit should we chose to use them. We sell firewood here as we did at Adams Tract but they have a small freezer here so we can sell bags of ice to the campers as well. The camp is smaller in land in compared to Adams Tract. Not as much to mow so we only have a push mower here as well as the commercial grade weed-wacker and gas powered blower. I miss the riding lawn mower very much. There is also a small storage shed here instead of a large garage building to store the lawn equipment. We have cleaned that out and rearranged things so that we can store some of our stuff. They also have a very nice washer and dryer for us to use but no extra refrigerator. The small freeze is filled with ice so we really can’t use that. Woods Ferry has the longest boardwalk of all the river camps. As the water has receded we have been shoveling off the river sand and cleaning off the leaves and other things that have accumulated on the handrails and fencing. As of today we have not seen the bottom platform but we can see the top half of the canoe racks placed next to the river. 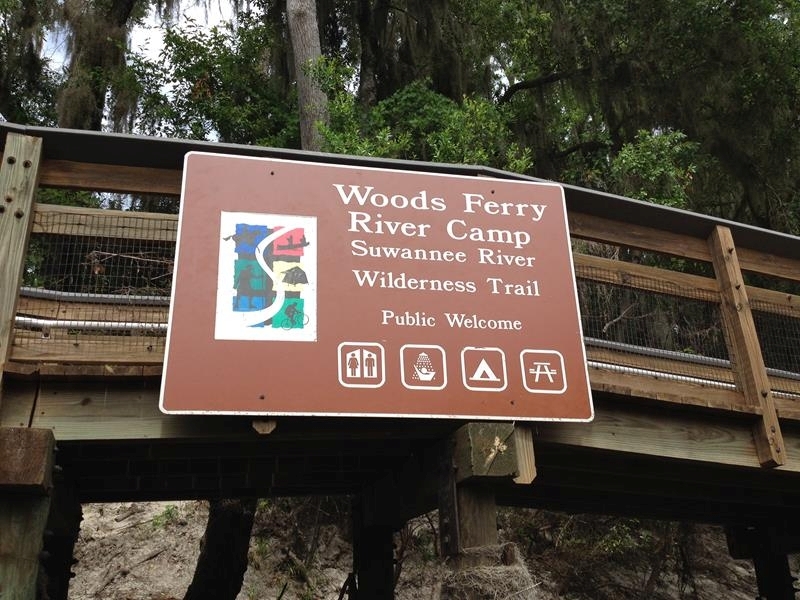 Since Woods Ferry is the first of the river camps and is now the camp further away from the new office at Lafayette Springs State Park in Mayo, Florida we have to keep up with our supplies to make sure we have what we need when we need it. The park rangers have to drive about 100 miles round trip to deliver us supplies, pick up trash and fix anything we can’t figure how to do. We are not very handy people but we can clean, mow, blow stuff off, sweep and paint what needs it. More Next Week. Last month we posted an article almost every day about various Florida State Parks and Forests that need volunteers this summer. We will try to post articles once a week but will post more if we get any more emails about needed volunteers in Florida State Parks and Forests. I am almost finished with an eBook about being a Florida Campground Host including Florida State Parks, Florida State Forests and Florida County Parks. We hope you will find it a very useful resource. More on this later.